In my first years as a music digger, I came across this concept called Progressive Rock. I didn’t understand at all what was behind this term. As a child I always loved when they played Moonlight Shadow on the radio, I didn’t know anything about the performer. I believe that at some point I came across a collection of hits from the 80’s where the song came up and that’s how I went looking for more of Mike Oldfield’s stuff that was classified under Progressive Rock in the Third Ear store which was then located on the Nordau street in Haifa’s Hadar neighborhood. I found that Pink Floyd neighbored in the same bin with Genesis, which until then I had known only as a pop band from the 1980s and had no idea of their activity in the 1970s. That’s how I discovered more and more artists and was totally caught up in the charms of the genre, a few years later I had a Progressive band of my own. What caught me, at first without theoretical knowledge at all, is the relative freedom in the music of those artists. I do not know if my assumption is correct, but the reason why this musical genre was labeled Progressive Rock was due to technical reasons – these bands contained the usual core of rock groups – bass / guitars / drums – to which added layers of different musical instruments and other effects that were really much more complex and sometimes bolder than what could be found in classic Rock acts, of course, the music itself is complex and the songs or the pieces are much longer than a regular Rock song. Even under this umbrella were sub-genres and phenomena, and what I am interested to mention in this context – Progressive Rock, especially in the circles of musicians and music enthusiasts in general, gets a lot of blows and was sometimes perceived as pretentious or ostentatious – sometimes justified – some of the artists belonging to this genre tend to show off their technical abilities with their musical instruments, and sometimes you can find whole albums filled with instrumental pyrotechnics and very little musical content with a statement. I have never been captivated by the technocratic content, and I have always connected to pieces and songs with clear shape and content – one that can be sung or played in the head. One of my first musical memories is related to Brazilian music. I do not know if this memory is accurate, but for some reason, I remember many days in the early afternoon after I returned from kindergarten, the radio was on, and there was always a song playing which I loved – always been played at the same time. I later discovered that it was Trem das onze performed by Gal Costa, of course, I had no idea it was Brazilian music. A few years later, my parents decided to leave my childhood town place for the kibbutz. This kibbutz was one of the last to preserve the collective character, which included the children homes, the shared dining room, and other kibbutz phenomena. Despite my great difficulties in joining the kibbutz as a child who grew up in a city, I found a lot of ‘compensation’ in the form of hobbies and out-of-school activities. My musical exposure to different styles was enormous. It is hard for me to believe that a child who grew up in the city at the time (mid-late 1980s) in Israel, received so much cultural enrichment. This kibbutz (Giv’at Oz) was established by a group of young Jews who came to Israel from Brazil and Hungary. That’s how I got to listen to more Brazilian music and actually get to know its unique sound. Leaping nearly twenty years ahead to college time. I was looking for a room to rent, not surprisingly I found one in a kibbutz (Broor Khayil). Most of its members were originally from Brazil. My neighbor Raphael, a door next to me, was a young new immigrant who only arrived two years earlier from Brazil – my Brazilian music spectrum also expanded thanks to him. A few months ago I decided to start diving into contemporary Brazilian music because all I knew until now was mainly recordings and acts from the 60s and 70s. I was not surprised to discover that the new generation keeps the Brazilian music in the groove, and that’s what you can find in the next mixtape: some of my favorite (and less familiar) old songs performed by the great Brazilian artists, and many new songs by young and interesting folks I discovered. I gathered some additional music for a second mixtape of the AsymmetricK series. This time I thought about the chance to maybe find what’s the original source of the old radio recordings I found almost 20 years ago. My dear friend, Sagi Sachs, a fascinating musician, lives these days in Leipzig, Germany. I sent him the link for the radio presenter snippets from the first mixtape, then he discovered with one of his friend (Thank you Alex), that the source came from the German SWR3 radio station in Stuttgart. Excited by the discovery I sent immediately an email to the station with an inquiry about my long time riddle – who is the radio DJ that played such interesting music on the radio back in the early 1970s? – I haven’t got a reply until now. Then I gave up my crazy fantasy which was – finding the original radio presenter and ask him to record for me a few snippets in German for this new mixtape. So then, Sagi took the mission and created these snippets for me – and now I am wholly satisfied with the results. You can listen too, here below. As a direct link to my last post and mixtape, that dealt with classic Motown and equivalent materials, I’m presenting here an introduction for some contemporary Soul artists and tracks. Yes, I decided to put these selections under the Soul title, cause I do have some difficulties with the R&B definition. As an educated, academic and self-taught music lover, I always referred the R&B definition to simply, Up-Beat Blues, that was popular since the 1940s. I don’t find much relation between the so-called contemporary R&B music and the one I mentioned above. Later I discovered some more reasons for using the R&B definition that I don’t find complimenting for the music and the artists, therefore, I find Soul much more appropriate – literally and historically. Sam Cooke considered being one of the pioneers (if not THE pioneer) of Soul music, with strong roots from the Gospel music, which is the main foundation of Soul. Now back to our days, I admit I never had a strong affiliation for contemporary Soul, but with almost any kind of music genre, I believe I don’t know much of it. During the last years, I encountered with some contemporary artists that drew my attention, and obviously, I could easily place them under the Soul umbrella. My current residence in Chicago also contributed to the discoveries, and I’m very proud to include some local contemporary Chicagoan Soul artists in the following mixtape. I tend to include some Israeli presence in the mixtapes that I’m creating, this time I encountered completely unexpectedly with one of the best contemporary Israeli artists, Karolina, featured in one of the songs (American production…) that I found for this mixtape. As always, I’m trying to find the music that not goes naturally to the Top 40 charts but still has some kind of added value. The urge to compile Motown-oriented mixtape was there probably since I started to fill this blog with mixtapes more than 5 years ago. But only recently have I had the time to really explore this concept. Each time that I visited our south Chicago grocery store, I was so amazed to find that the background music contained mainly classical soul songs from the 1960s and 1970s, and of course a respectable chunk of it performed by the Motown artists of the day. My surprise was the result of what I was accustomed to finding in Israel when it comes to background music in public spaces – mainly digital instrumental versions for cheesy pop music, and never original, classical versions of good music like they play in the U.S. in public spaces. I like to challenge myself as much as I can, especially when it comes to music. It would be easy to understand that I have a strong attraction to the past. I like history, and mainly the thrilling and sometimes mysterious and vague phenomenons… but, as much as the past has so much to offer when it comes to music, I still like to ‘fish’ some new, current acts from time to time. Then maybe it’s natural that the current music that attracts me falls under the category of Indie music, once having been related to independent musicians that produced all their music on their own – from A to Z. Today this concept is much more fluid. There are of course some completely independent artists that do not depend on manager/ label/ booking and so on. Today it is possible to find new music that is produced by record labels and entrepreneurs that still call themselves Indie. I believe they do this primarily to separate themselves from the mainstream. In short, I think that the right way for looking at the Indie stream these days is just as an alternative space rather than dealing with mainstream characteristics. It took three years since the last time I compiled an Indie nugget, now, during the last months I had the urge to look for some new materials, my ears are wide open, whether I’m browsing the web, getting recommendations from friends, ‘Shazaming’ some tunes in restaurants, barber shops or even some materials from interesting radio stations – this blessed musical treasure is endless… so is the time it demands to filter through it to find what moves me… This time I found some interesting Canadian artists among the featured American majority, the mixtape ends with the Israeli representation of Tatran, a very young and talented instrumental trio. After a year of absence, I’m coming back to write: This time with a new look and new format. From now on, this blog can be read in English and Hebrew and invites everyone on the globe to be part of my musical world. Last year I experienced a massive upheaval in my life as I knew until now. After a long and intense process, I moved to live with my love in the United States. I wasn’t ready for the intense emotional experience involved with such a change. And so each time I encounter a new sight, new behaviors, the different seasons – all these raise associations to my fevered brain, and naturally, there are many appropriate soundtracks for these associations. The next mixtape ‘nugget’ features tracks that accompanied me at different times in my life, some of them at very young age, some later and some from recent weeks. Each one of them sparks something very emotional in me. My first encounter with Indian music started like many others with the Sitar of George Harrison in the song ‘Within without you’ from Sgt. Pepper lonely hearts club bands of The Beatles. It was at the age of 12, and I remember that in the first times that I listened to the record I just lifted the arm and skip to the next track – it was too hard for me to digest this kind of sounds. Not much time went by, and after several playings of the record, something drew and hypnotized me to this musical mystery. In 2002 I went to India right to the lap of Varanasi, there I started to learn to play the sitar for few months. One of the first things of the irritating routine there was the absolute flood of the current hits from the current blockbuster films. At least in 2002 the pop music that was presented in a typical Indian street was taken from the cinematic musicals (that are famously known as Bollywood movies). Every place you pass, if it’s just on the open road, when you sit to eat in a restaurant, when you walk through shops or in the market – everybody listens to the Bollywood songs. That way, as a foreign tourist, love music or not, you can’t get away from them. Like every new thing you experience in a place like India, and particularly a place like Varanasi, it takes time until you absorb something outside your Western ‘European’ layers such I possess. And so, this kind of music trickled slowly to my veins, and in the minute that I started to discover some interest with these songs, I realized what drew me so much – to differentiate from the traditional Indian music, the music of Bollywood is incredibly rich with music instruments and especially festive strings. These lush arrangements bring with it harmonies respectively, at least, this is how I recognized it as a western listener. And this is not just harmony, it is sometimes very bold harmony, depicted with very bold chords assigning. If I compare it to the current chord progressions or sequences in a typical western pop song – the Bollywood harmony style will challenge the avarage western ears. Only in much later stage I understood that this ‘harmony’ that I point to derived because of the use of the traditional Indian music scales (the Indian Ragas). These Ragas could be very asymmetric comparing to the ordinary western scales. The arrangers that made the orchestrations for these Bollywood productions composed the orchestral accompaniment in a way that it will thicken the melody and the singing that exist in the songs which are based on the Ragas. When we come and analyze this orchestrations and harmonies with the notion about the Ragas, the perception is changing and we could easily see that this ‘bold harmony’ is only a matter of combination between the traditional scales and musical ornaments and only rarely real chords are played as we know from western music. The acknowledgment and the study about the behavior of the music and arrangement of the Bollywood songs gave me huge inspiration for my own personal music creation, and if nature will, you could experience some of it too. Meanwhile, you have here colorful first sale for a holiday. In these unbearable days of lack of real positive horizon, I feel it will be the right thing to upload this post to the air. I don’t have any kind of pretension to give here an idea for conflict solution, or maybe it will be more accurate to say an idea to prevent from these factors to rule our lands and governments who just want to keep the peace away from us. But, let’s put the politics aside. This time I decided to wallow in the most nostalgia without any kind of concerns about my will to share ‘decent’ musical material or less familiar like I tend to do on the posts of this blog. All started a few months ago while I cleaned my apt. I decided to solve some very irritating problem that I found just when entered to live here, but it took me a while until I decided to do something. Are you familiar with these sliding doors that slide into the wall? I have such double doors in my bedroom. For some reason, they couldn’t be open completely, and it really pissed me off, so I removed the stopper that prevents the doors to move the opposite way, and then I got way to the inner tunnel inside the wall – and what did I found there? the thing that prevented the doors from sliding to the end were simply old newspaper chunks that someone stuck there for an unknown reason. Of course, I pulled them out and as an elderly coming nostalgia enthusiast, I spread them, and I discovered some entertaining stories and advertisements. Most of these newspapers are from 1984, and then I recalled that I have a reel tape found in a pile of reel to reel tapes that my former boss gave me some years ago while I worked in a local radio station. My boss worked before for years as a technician in the national Israeli broadcast authority and one of the things that he did there was preparing commercials and jingles for the radio. Until the computer age with sound and actually until the mid-1990s the radio stations used Cartridge tapes for jingles and commercials (you can see bellow the pics of these tapes and their player). 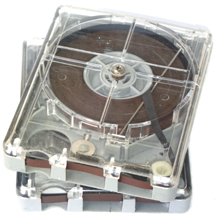 One of the advantages of this kind of tapes is that their internal magnetic tape is constructed as a loop when the recording material finishes it returns to the start position and the player automatically stops and ready to play the cartridge from the start. The cartridge player had a nickname – Toaster, because of the resemblance to the bread toaster. One interesting anecdote, I don’t know who of you can pay attention to the audible signals between the commercials that I fixed between the songs on this featured mixtape. I remember myself as a kid hearing these ‘ding-dongs’ between the jingles and commercials and I didn’t understand why they been there. Apparently, this is the electronic signal that tells the cartridge player to switch to the next commercial that was recorded on a different cartridge and was located in a different slot of the player. I came to a conclusion that these ads prepared for broadcasting at the end of August 1984. With the relics that I found behind my doors I got the inspiration to create this mixtape and then recalled with a pic of myself, very typical of this era while I was 6. I used to sit on the floor and played for hours with Lego and listen to the radio (besides my mythologic record player that I already mentioned here). In this nugget I don’t find a lot of musical value with the songs that I picked, some of them I really love and anyway my purpose is sheer escapism when we have a desperate crisis. I think I’ve got a real good timing for releasing this mixtape – We are on our post-holiday of Poorim (a Jewish holiday that can be compared to Haloween – people dress in costumes etc.) The musical content that integrated here deserves this fun atmosphere of the holiday which many times related to some common figures from the media when many people wear costumes of famous characters that sometimes come from TV shows, movies and so, and of course, each one of them has a certain musical theme. Most of the tracks that are featured here had a function which was to serve these themes for TV, movies or radio transitions. Most of them are extremely seriously performed by their artists, but I assume that today most of the average listeners who accidently encounter which such music will probably raise a smile (which is completely cool) or maybe they will be attacked with sticky nostalgic emotions (oh well). I have another ulterior motive to publish this mixtape. I think it is almost a week from since our Israeli minister of communications, which is responsible for the public TV and radio network, declared that he’s going to dismantle this immense authority. This subject of media institutions relates in my mind to the fascinating creativity of different musicians who were asked to compose for the institute or the musical directors and editors that have been invited to pick some already recorded materials as functional music which suppose to serve the goal of attracting attention momentarily from not necessarily captivated listeners. I want so much to thank for this opportunity to the courtesy of the artist Dragan Nikodijevic for letting me use his art for the cover of this nugget which is very appropriate for the musical content. You can click this link for watching his other works. Have a great warming winter!